The Pharisee Nicodemus is not a member of the main cast of the Gospel according to John. In the parlance of television, he would be known as a recurring character. If each chapter of John’s Gospel were an episode of a TV series, it would fill one standard network season, and Nicodemus would guest star in episodes 3, 7, and 19. We meet him at the beginning, middle, and end of Jesus’ ministry, and each time we drop in on him, Nicodemus is somewhere new in his own journey towards an active faith in Christ. Imagine with me the thoughts of the Pharisee Nicodemus on his way home from helping Joseph of Arimathea bury the body of Jesus. Nicodemus appears at the end of the Passion Gospel reading, as well as two other places in the Gospel according to John, both of which are referenced in what follows. Two years ago, I knocked on a door. I waited until nighttime and wrapped myself in a traveling cloak with a deep hood so no one would recognize me. Was I afraid to be seen with Jesus, who my colleagues branded as a dangerous radical? Yes, but fear was not the main reason for my caution. I was ashamed. I was ashamed to admit that I didn’t have all the answers, ashamed that someone else’s words could make me feel so infantile, like a newborn baby. So I hid myself in darkness, not to protect against prying eyes, but to conceal me from myself. I hid from myself. I hid from the version of me that Jesus was beckoning to emerge from some long forgotten exile. I used to relish my position on the council, my authority as an arbiter. I took pleasure in the blank looks of acceptance on the faces of my litigants. They invested me with the power to judge, and I failed to notice when that power mutated into self-assured complacency. Predictability became my idol. There was never a new problem to be solved, never something I couldn’t explain or interpret or analyze. Over the years, I forgot how to ask questions because I was always the person with the answers. Ever since that night, I have heard his words carried on the wind. Since the wind blows where it chooses, my idolatrous reliance on predictability has vanished. Since I don’t know where the wind comes from or where it goes, my fantasy that I have all the answers has disappeared, as well. On my way to see Jesus, I was hiding from a new version of me. But everyday, I felt Jesus’ words drawing that new version out of me. Last year, I reminded my colleagues to obey their own rules. No one on the council had discovered my secret meeting with Jesus, so my position was safe. The two versions of me occupied the same body, and, at that time, the familiar one dominated still. But I had begun to question and look past the veneer of institutional banality. A small voice inside me murmured: “I do.” Then a louder voice: “Careful. Careful.” When I spoke, I tried to defend Jesus without giving myself away. “Our law does not judge people without first giving them a hearing to find out what they are doing, does it?” But they were implacable. That’s when I noticed something I would never have seen had Jesus not awakened my curiosity. These colleagues of mine, the keepers of tradition, the self-proclaimed protectors of the Law, were breaking their own rules. I could no longer be party to such bankrupt ideals and blind action. That day, the small voice grew louder, the voice attached to the new version of me. Today, I buried my Lord. Two years ago, I went to see him at night to cloak my own shame. But today, the sun shines down, unaware that its brightness mocks the darkness in my soul. The sun shines down, and I walk out under its beams so the world can see where my allegiance lies. When first we met, Jesus said to me, “Those who do what is true come to the light, so that it may be clearly seen that their deeds have been done in God.” It took two years, but here I am. Here I am in the light. See, all you who pass by: I am one of his. I am not the person you knew. I am a new version of me, the version Jesus called out of me. See, all you who pass by: I am not ashamed any more. I feel the wind on my face, and I know his words are true. See, all you who pass by: is there any sorrow like my sorrow. My Lord is dead. It took his death for the old version of me to die. But will my new version survive with him gone? Will I have another chance to walk in the light? Has the darkness won? When will the light return? Updated from a piece I wrote for Good Friday, 2009. 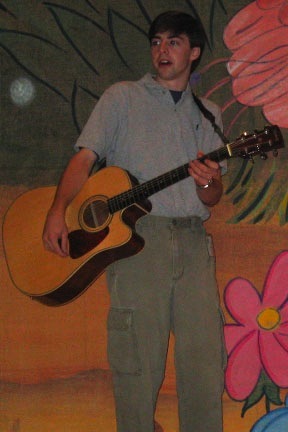 Playing at VBS in 2003 after my sophomore year of college. That was less than three years in to my guitar playing. It would have been seven or eight if I had never quit. When I was in seventh grade, my parents bought me a three-quarter sized guitar and procured the services of a guitar expert to teach me the basics. At the first lesson, I learned the names of each of the six strings and how to play notes by plucking them. At the second lesson, I learned how to arrange my fingers on the strings so they made special shapes called chords. At the third lesson, I learned that I would have to practice if I wanted to improve my guitar playing. There was no fourth lesson. You see, I was a bright kid, to whom pretty much everything came quite easily. I was a good athlete, so baseball and soccer were right up my alley. I really didn’t have to work much to make good grades in school. I had next to no challenges in any of my classes. And so when I was confronted with something that I couldn’t immediately master with no effort, I decided not to try. I put the guitar in the case, and the case sat unopened in my closet for years. Now, as most of you know, I am a guitar player. So what happened? I picked up the instrument again my senior year of high school, and, being a tiny bit wiser than my seventh grade self, started practicing. I’ve been playing for over eleven years now, and I’m not half bad, but a wistful part of me always wonders how much better I would be at the guitar if I had not quit after three lessons back when I was thirteen years old. My seventh grade self fell victim to a psychological epidemic that affects the vast majority of the population. Exactly one symptom characterizes this epidemic: people have difficulty agreeing to perform tasks that fall outside of their recognized competencies. This is still true for me: you’ve never seen me do ballet or fix the central heating in the church because these are two things that I don’t do very well. I have no training in either of these areas, and so the likelihood that I will agree to pirouette across a stage or put together an HVAC system is next to zero. I’d be willing to wager that this fact of life is also true for you. I’m sure each of you could come up with a list of things you are unwilling to try because you know that you aren’t going to be good at them. You know that if you tried, failure would be in your future, and who wants to feel like a failure? And so the psychological epidemic keeps us from attempting new things and keeps us safely ensconced within the borders of our comfort zones. For us this morning, the trouble comes when the list of things we are unwilling to try includes speaking openly about our faith in God. Why should this be any different from playing the guitar or doing anything else, you might ask? The simple answer is this: becoming an expert in guitar playing is possible. Becoming an expert on God is not. Nicodemus’s “we know” sets him up as the so-called expert on God. The irony is that his statement is true. But Jesus isn’t interested in whether or not Nicodemus speaks correctly; Jesus is solely interested in moving this so-called expert into the unfathomable depths of God’s interaction with God’s creation. “No one can see the kingdom of God without being born from above,” says Jesus in response to Nicodemus’s opening remarks. Jesus’ statement is intentionally ambiguous. The words could mean “born from above or born again,” and I think Jesus means both. The very ambiguity of the phrase shows Jesus’ attempt to push Nicodemus out of his comfort zone where “we know” is his default position. For his part, Nicodemus latches onto the more mundane of the two possibilities: “How can anyone be born after having grown old?” he asks. This response might sound a bit sarcastic, but at least the Pharisee, who has always been the expert answering questions, is now beginning to ask some of his own. The question is the small chink in the armor of Nicodemus’s expertise. Because of Nicodemus’s willingness to ask a question, Jesus sees that there is hope in showing him the expansiveness of all that this so-called expert does not know. In just one conversation, Jesus shows Nicodemus that being an expert on God is not only not possible, but also not the best way to be in relationship with God. Only by acknowledging his lack of understanding can Nicodemus hope to begin to hear the sound of the wind blowing, this wind of the Holy Spirit that breathes life into creation. Nicodemus’s job is no longer to try to explain what makes God tick. Jesus gives him a new job: to bear witness to the mysterious movement of God in his life. We see Nicodemus twice more over the course of the Gospel. In his next appearance, he puts one tentative foot outside his comfort zone when he reminds the rest of the council about their own rules when they want to put Jesus to death. And in his final appearance, we see that Nicodemus has fully embraced the new life that Jesus revealed to him. In broad daylight on the afternoon of the crucifixion, Nicodemus helps Joseph of Arimethea take Jesus from the cross and bury him in the tomb. This so-called expert on God had his world turned upside down that night when he went to see Jesus. Jesus showed him that expertise is neither possible nor desired when relationship with God is concerned. There is not a person on this earth who is competent to talk about what makes God tick. While you and I might have difficulty agreeing to perform tasks that fall outside of our recognized competencies, we can take heart in the reality that Jesus released us from needing to be competent in this particular area. We will never be good at talking about God because God is far too glorious, far too mysterious and majestic for our puny words. But that shouldn’t stop us from trying. Releasing us from the need to be competent means that Christ rejoices in even our most halting attempts, in even the simplest expressions of feeling God’s love. My prayer this morning is that each of us might feel released from the need to be competent when we have the opportunity to speak to someone else about our faith. Don’t be like my seventh grade self who gave up the guitar because he wasn’t an overnight expert. Rather, acknowledge that expertise has no domain where God is concerned. The simple word about how you feel God’s movement, spoken from the heart, is worth more than any treatise on the inner workings of the Holy Trinity. The halting word about not understanding God’s movement is worth more than all the “we knows” like the one Nicodemus speaks when he first encounters Jesus. The good news is that God uses our incompetencies as much, if not more, than our competencies. So I challenge you and I challenge myself: live into our incompetent ability to speak of God’s movement, and perhaps through our witness, someone new might start seeing God’s wind blowing through the trees. Imagine with me the thoughts of the Pharisee Nicodemus on his way home from helping Joseph of Arimathea bury the body of Jesus. See, all you who pass by: I am one of his. I am not the person you knew. I am a new version of me, the version Jesus called out of me. See, all you who pass by: I am not ashamed any more. I feel the wind on my face, and I know his words are true. See, all you who pass by: is there any sorrow like my sorrow. My Lord is dead. It took his death for my old version to die. But will my new version survive with him gone? Will I have another chance to walk in the light? Has the darkness won? Will the light return?